Chronicles of Zostera: I am famous! Well, not really, but I can dream right? There as an article in the latest issue of the Suffolk Times ( a local east end newspaper) about hard clams in Hallock Bay. 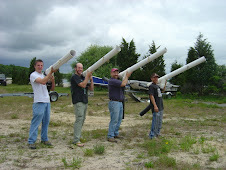 Now, the basic summary of the article is that a group of local baymen had raised some money to plant seed hard clams in Hallock Bay, NY. If you have followed my blog at all, then the name Hallock Bay should sound familiar to you - its the location of one of my dissertation projects and a place I spend a lot of time in the water (and here, and here). Anyway, back to the article. 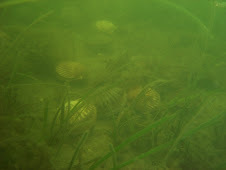 The baymen released 85,000 8-month old notata clams - about the size of a thumbnail - into a portion of Hallock Bay. 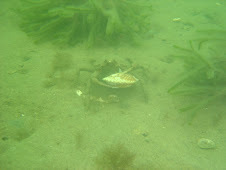 They selected a bottom with considerable cobble as their planting area in the hopes that the structure will protect the juveniles from their predators like whelks and crabs. "The fishermen agreed that Hallocks Bay is a good spot for clamming, but they pointed to a broad swath of coastline, opposite the grounds they were seeding, that has been closed for two years -- not because of poor water quality but because of a study Stony Brook University students are doing to see if they can simulate eelgrass bed habitats with synthetic eelgrass." That's me! While the project isn't exactly described right, and I am not mentioned by name, it is still quite exciting to see my work in the paper, regardless of how small or anonymous.